Louisiana Radio Communications was founded in 1947 with a staff of two. Now Louisiana Radio Communications employees over 70 trained and certified personnel! LRC wireless is based in Lake Charles Louisiana with offices in Lafayette and DeRidder Louisiana as well. With 3 locations strategically placed in Louisiana, LRC wireless has grown to be one of Motorola’s top providers not only in Louisiana but in the United States! For over 75 years LRC Wireless has been handling applications of wireless communications including sales service and warranty services , two-way radio systems, design and construction of wireless computer networks, antenna systems, tower sales service and erection, fiber optics voice and data installation LRC wireless prides itself on 75 years of top rate service. In fact, LRC wireless challenges anyone in America to beat their service! 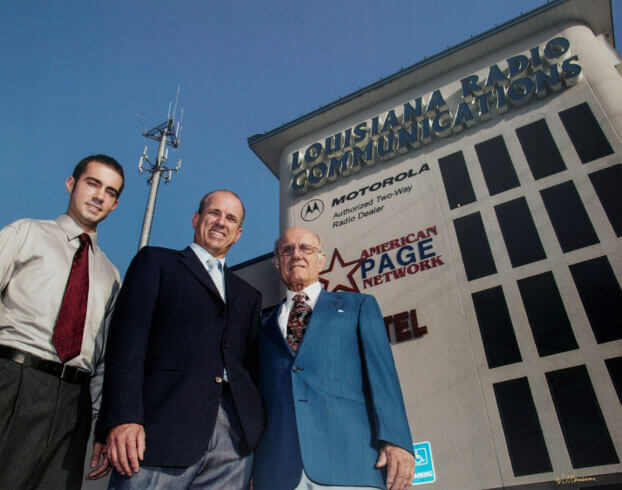 Louisiana Radio Communications is the premier system integrator of wireless communication systems and services for Motorola Communication Equipment. Our team of sales, service, engineering, and operations are among the most qualified and best trained in the wireless industry. Temporary or cyclical increases in activity, special events, promotions Scheduled maintenance, construction and short-term projects Public safety, emergency response or disaster relief Coordination of emergency efforts between teams, departments and organizations Our inventory consists of portable, mobile and base station radios in VHF, UHF and 900 MHz frequencies and Privacy Plus technologies. Contact us to design a radio solution for your specific needs. We provide outstanding service to our customers before and after the sale. Our employees are dedicated to providing each customer that walks through our door with the highest level of assistance. We systematically determine each individual customer's wireless needs; cellular phones, two way radios or one of our emerging products, and then develop a solution that best matches those needs. That is why we sustain more customers and receive more repeat business than any other dealer in the area. Our customers stay our customers because they know that they can expect more from us. Clearly stated, we are the one wireless company that customers can count on. We have worked hard to earn this distinguished reputation. Call on us and experience the difference. By working with us, you are assured a total plant communications network that meets your needs today and one that can grow with you tomorrow, as your requirements change.